Adam Lambert’s back to his busy schedule, less than a week after coming home from the close of the North American tour with Queen in Houston. On Thursday, he was on the Red Carpet for the OUT Power 50 Gala, and next Saturday will perform a tribute to George Michael at the Project Angel Food Gala Event. Although Adam did not make the OUT Power 50 list of LGBTQ influencers, released in July 2017, he is certainly highly regarded in the cause and we should celebrate his appearance there. Check out Adam’s shoes in the full-length picture above. 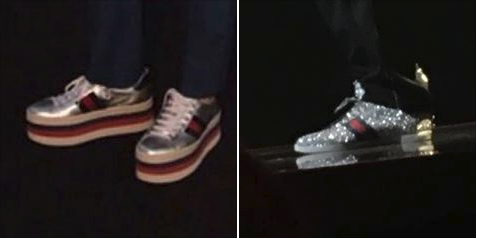 Now, check out Brian May’s shoes from a QAL concert this summer. They have the same Gucci stripe. I heard that Brian said from the stage that they were a gift. Do we have to really guess who from?! Catch up with Adam on the Red Carpet below. I love Adam for his open heart & mind and speaking out about TRUTH! Most people are NOT comfortable about THEIR TRUTH! You have one life to live & it is fleeting. Be your true authentic self & screw the ones that don’t accept you, harshly judge or assume that we should all be exactly like everyone else! One of the most amazing “GIFTS” an individual can give themselves… is the acceptance to live”THEIR TRUTH”! I have a Transgender daughter (Male to Female) 23 yrs of age & since she can out to us at the age of 15 we have offered her our love, respect & support…she has totally blossomed into a VERY HAPPY…most lovable, thoughtful & great full young lady! We couldn’t ask for anything more! I know is some capacity she will pay this forward into the world! We need MORE LOVE & MORE ACCEPTANCE! So great full & pleased that OUR ADAM, is a spokes person…for loving & accepting ones true self! You may be able to fool others…but you CAN’T fool yourself without it robbing you of your inner strength & your life! Also, I CAN’T WAIT for Adam’s new music!…bring it on Adam baby!!! It’s always great to see Adam in the press!! !